Internet marketing has changed many times over the years, and continues to change every day. We offer basically all types of Internet Marketing services, from social media marketing, to viral marketing campaigns, to advanced search engine optimization. But before we begin with exactly what it is we can offer to you, we thought it best to say a word or two about the current state of Internet Marketing on the web, and in particular SEO. When we first started offering Internet Marketing services (back in the 90s), Search Engine Optimization didn't even exist. 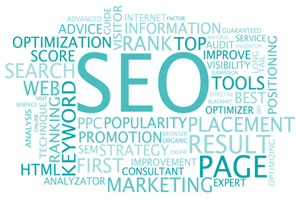 Now, Search Engine Optimization has become the de-facto method of marketing web sites. However, this is also a problem because there are so many individuals on the net claiming to be SEO experts, yet not really truly understanding the full picture behind how it can be used in conjuction with other efforts to acheive real results. This happens because the term 'Search Engine Optimization' has become a kind of buzz word that can mean multiple things. So someone with only a little experience in one aspect of search engine marketing, can go around claiming to be an expert and charge exorbitant prices, never provide any real results, and get away with it. It is for this reason that we are cautious about directly advertising SEO services, so as to distance ourselves from this current problem that web site owners are confronted with. We decided to include basic SEO techiniques applied to all designs at no additional cost. With enough experience in SEO, this becomes second nature, so it really does not take us much more time to give you a basically SEO ready site, than one without these concepts applied. There is much more to search engine marketing, so if you ever want to take it to the next level, we can also help you do some keyword / competitor / search term research, help you build links, pagerank, search engine rankings, and ultimately contstant quality traffic. While acheiving great search engine rankings can be the corner stone of your business, and lead you to years of success, there are now many more ways to supplement this. The social web (some call it Web 2.0 Marketing) has already reached its critical mass, and there is no doubt that the future of the web will be strongly social. So sites like Twitter, Facebook, Youtube, Linkedin, Reddit, and many others drive millions and millions of hits to web sites every day. What many web site owners do not realize is that there is a group of people who use (and sometime 'manipulate') these systems every day to help drive traffic to the sites of their choosing. Our owner, for one received a bit of Internet fame when he exposed to the world how any one in the world could get the front page of the social bookmarking site Digg with just a little time invested. This represents millions of potential hits to a site, and has the ability to actually take a site with average traffic and turn it into a power house in a short period of time. Needless to say, Digg was not too happy about this, and changed their algorithm within two weeks to counteract the many people who began successfully following Bryant's techniques. Most of the techniques still apply to all the social networking sites, and we stay on top of them every single day to always move with the latest of social media marketing. Along with having properly designed and effective web site, if you are serious about Internet Marketing, you'll want to consider building a web presence on as many different avenues as you can. For example, along side your business web site, you may want to have an independant blog, a twitter account, a facebook account and group, etc... The possibilities are almost endless, but the idea is to be able to reach as many people, in as many ways as possible all while helping to build your brand throughout the net. While this technique may not be for all companies, as it does take some time to maintain, it can be a good aid for many new web sites looking to launch strong. We can help you get started, or may even be able to find an expert in each of the sites to maintain the sites for your everyday if that is what you desire. We try to offer customized solutions, because when it comes to internet marketing it is often not a one-size fits all type deal. While one site might be perfect for a social bookmarking campaign, another site might not benefit much at all from it because of the nature of some of these social media sites. Check out our marketing packages here.